A lot of different--yet related--thoughts have been swirling around in my head lately. 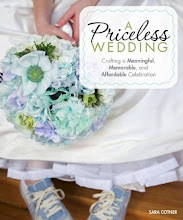 First, I've been re-reading my book from start to finish, A Priceless Wedding: Crafting a Meaningful, Memorable, and Affordable Celebration. 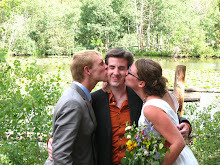 It's been four years since Matt and I tied the knot--about five since we started planning our wedding. The process of writing the book stretched out over many years, so it's a strange experience to sit down and re-read about our experience from cover to cover. I was reminded of all the insecurity I felt while planning our eco-friendly, budget-minded, handmade wedding. Matt and I tried to muster all the courage we had to forge our own path on our own terms, but we had no idea if the whole thing would fall flat on its face. We faced naysayers at various points in the process (neither my step-father nor my best friend wanted to help us cater our own reception; my grandfather didn't want to speak in our non-traditional ceremony, etc.). But when it was all said and done, it was the perfect wedding--for us. 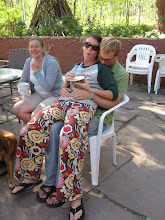 It was completely focused on community, connection, commitment, and fun (and my best friend ended up helping us cook and thoroughly enjoyed himself). We learned such valuable lessons during that process. We learned that starting with the big picture vision helps you make more strategic decisions along the way. If you know where you're trying to get to, then it's easier to figure out which choices along the way will get you there. We learned that dreaming big and dwelling in possibility are exhilarating (albeit quite scary). We learned that forging our own unconventional, authentic path can incite adversity and judgement and doubts (which can easily make us feel insecure), but we're ultimately responsible for our own lives and our own happiness. We can't waste our "one wild and precious life" by trying to live someone else's dream. Since then, we've continued to dwell in possibility. We often talk about what are joint dreams are together and how we're going to make them happen. We realized that it made the most sense for us professionally and personally to move from Houston to Austin, so we figured out how to make it work. Now we're thinking a lot about what kind of family we are and what kind of family we want to be. We've spent the year figuring out which neighborhood we want to settle into (verdict = a diverse neighborhood in East Austin) and where we want to send our children to school (verdict = Austin's first public Montessori school). We've had to think a lot what kind of house we wan to live in (verdict = 3 bedroom/2 bath house on a 1/2 acre with close enough proximity to town and natural views out our windows and room for a garden and fruit trees). I've also been thinking a lot about how to pursue my professional goals (which are admittedly ambitious and time-consuming), while prioritizing my personal goals (e.g., plenty of quality time with my family). Then I stumbled upon this article about how the COO of Facebook leaves the office at 5:30pm each day. It was shocking to me that the idea of leaving the office in time to eat dinner with your family was so novel and worthy of attention. I absolutely want to be an effective leader who accomplishes big goals and prioritizes family. There's no use trying to make the world better if I only make my own life (and the life of my children) worse. Then Kristina led me to this article about how our quality of life impacts our life span. It made me think even more about my future and the kind of life I want to lead beyond my current plan for the next couple decades. It inspired visions of moving to an island or starting a retreat center or moving near my children to help out with my [future] grandchildren. And all that planning brought me back to a conversation with my best friend about the power of living in the now. That's when I decided to give Hoss a really good belly rub and introduce Henry to the glory of hot chocolate for the very first time. Our lives are full of choices and the choices that we made continually reshape our lives. Of course there is so much that is not in our control, but I am inspired by how much is in our control. I can choose to celebrate what is right in front of me. I can choose to figure out how to balance the professional with the personal. I can re-evaluate at any time and make adjustments as necessary. I can constantly ask and attempt to answer Mary Oliver's question: "Tell me, what is it you plan to do / with your one wild and precious life?" P.S. : Purposeful Conception: Preparing Your Mind, Body, and Life for Pregnancy started today. There's still time to join us. Register today! We'd love to get to know you better! wait so you felt judged by your stepdad and best friend because they wouldn't help you cater your own wedding? i guess it just depends on how you define a wedding and reception. i view it as the biggest celebration of my life (aside from hopefully my funeral) where i can see and entertain people that i love and have supported me. not a time to freeload off my family and friends! this whole concept is very strange to me. why not just not offer food if you don't want to pay for it? why expect someone else to do the work? My husband and I catered our own (rather small) wedding too, and it worked out so well that I'm so glad we didn't go with another plan. Naturally, we relied on family and friends to help us out too. 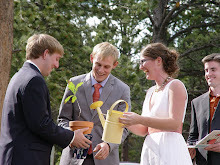 Everyone seemed to have so much fun having a "hands-on" role in our wedding. People saw me clearing dishes after dinner and then naturally started to help out with other tasks. I think there is an unnecessary division in today's common mindset about food prep and chores being "work", whereas my husband and I just see it as a part of living. From this viewpoint, being a "guest" doesn't necessarily mean "not getting your hands dirty". How food is incorporated into the celebration depends on individual values. We both love spending time making healthy and delicious meals, and we wanted our guests to enjoy a meal that reflected our values. They reciprocated by pitching in with the clean up, and everyone enjoyed themselves. Participating in these tasks together facilitates a lot of quality time together. When it comes to planning a wedding, a lot of goes into it and in the end you can really learn a lot from it.